Authorship and your use of Google+ in relation to your website has ben a hot topic on blogs and at Search Conferences over the last 6-9 months. Understanding how your authority as an author/writer can effect the search engine results for your keyword phrases has become something of a quest for many search marketers. Google has made the connection of blog and Google+ fairly simple, but there are still issues and barriers to entry out there. Many small businesses who do not live and breathe search marketing are not aware, or have not taken the time to establish authorship for their websites. The honest truth is, there is solid proof that using this connection will help YOUR search results attract attention – and why not – the image, additional data, and larger result can make all the difference in the world when you’re trying to attract an eyeball. Authorship results have 7 lines, non-authorship results have 5. 2 lines is a lot of real estate on a page, don’t discount it. According to Briggs, Google noticed that larger images (50×50) attracted more attention from searchers, the tiny images next to “shared by” text received little-to-no attention, so how do they encourage people to give them good images, and a way to connect an author to an article? Now the writer is PROVIDING Google with information they can use to connect authors with content, and a way to display it that encourages engagement. ENGAGEMENT in all caps. 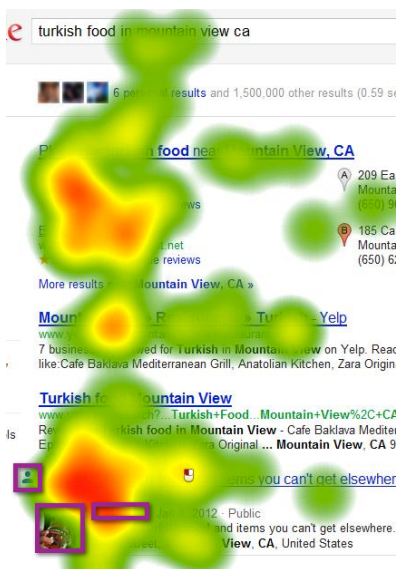 Check out this heatmap from a google search result that contains a listing with authorship established and an author image next to the content. If you’re familiar with how this heat map previously looked, the result in the VERY TOP LEFT generally received the most attention. Universal and personalized search changed that when video thumbnails and other signals were included in the 10 blue links. Check it out now!! Check out that super hot spot next to the Authorship snippet for the article above. Arguably it’s hotter than the spots above it – all because of an image and some additional information pulled from authorship markup. Can you afford to NOT have this set up on your website? I think not. This entry was posted in Analytics, SEO, Social Media by Carrie Hill. Bookmark the permalink.